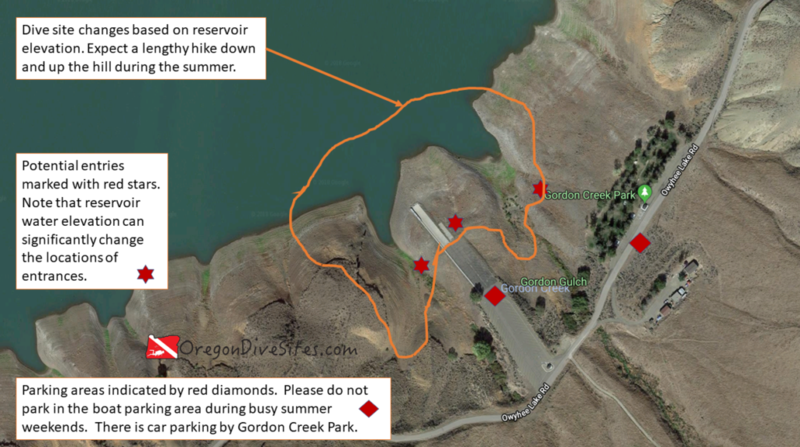 Gordon Creek Park and the Gordon Boat Ramp is a good place to check out Lake Owyhee with a nice shore dive. Southeast Oregon lakes aren’t that great for SCUBA diving but if you’re coming from Boise or want to do something different than a dive along the Oregon Coast, this dive site is a reasonable choice. The lake is high enough that altitude diving restrictions apply so do make sure to plan ahead. Gordon Creek Park and the Gordon Boat Ramp is a good place to go do some diving in Southeast Oregon. Just be mindful of boat traffic and don’t forget that this is an altitude dive. When diving this site, be sure to steer clear of the boat ramp unless there isn’t any boat traffic. On busy summer weekends, boaters will not expect to see a SCUBA diver at Gordon Creek Park. It would be a very good idea to have a dive float flag to tow behind you. Indian Creek Campground: There is some cool topography to dive around on the point north of the boat ramp. There is car parking up by the road and the park. The parking along the boat ramp is meant for trucks with boat trailers. Talk to someone who works at the boat ramp or park before parking a car in a boat trailer spot. The dive site unfolds along the southeast rim of the canyon. Head north to get to the deepest part of the lake. Head west or east to go along the canyon walls. Be sure to watch for boat traffic. Boaters won’t be expecting to see SCUBA divers at Gordon Creek Park. Depending on the water levels in the reservoir, you may only have to walk a few feet to reach the water or it may be a significant slog to get down to the water. Watch for slick mud near the water line if the reservoir has been drawn down quickly in recent days. This is a shore dive but you can also do a boat dive or launch a boat from here to do boat diving elsewhere in Lake Owyhee. There can be some waves from boat wakes but otherwise the only other potential underwater hazard is the current that can sometimes run along the very bottom of the lake. In the late winter and spring when the water flow rate into the lake is the highest, you will have the best chance of decent visibility. 30 feet is not unheard of here. During the late summer, algae blooms and stagnant water can make for 3 inches of viz. In the winter, water temperature can be near the freezing point. In the late summer in a drought year, water temps can get up into the 60s especially in the top 15 or so feet of water. You have the best chance of decent viz in the spring. There also is usually a little less boat traffic then. You might hit 110 feet at the absolute deepest part of the submerged canyon if the reservoir is completely full. This is an altitude dive site. You will need to have altitude training to do this dive. We rate this an intermediate dive site because of the altitude dive requirement. When the reservoir is full, you’ll only need to walk a few feet. If water levels are low, you might need to walk up to 1000 feet from the parking lot. No surface swim is needed here. The submerged canyon walls are steep. There are several state park campgrounds in the immediate area that make for a good base to do some diving around the lake.